What you have here is a serious India Pale Ale shacking up and hunkering down with mango and apricots. At the same time! Romantic Chemistry is brewed with an intermingling of mangos, apricots and ginger, and then dry-hopped with three varieties of hops to deliver a tropical fruit aroma and a hop-forward finish. It’s fruity, it’s hoppy, it’s tasty! Poured from a 12 oz bottle into a tulip glass. The page here says brewed with mango and apricots, but the bottle says mango, apricots, and ginger. Beautiful deep orange color with a bubbly off-white head. Leaves some stringy lacing. Mango and apricot are both present in the aroma, along with some orange marmalade and red grapefruit zest. A little honey. A sharp note that is probably the ginger, and some herbal/grassy bits. Nice. Sweet dried apricots, herbal tea, and astringent ginger hit me first on the taste. There's some kind of tropical fruit but it's hard to pin down mango. Red grapefruit, white pepper, and green hops on the end. Finishes dry and clean with a lasting bitter, fruity aftertaste. Spot-on carbonation and texture. Starts medium-bodied and a little viscous, ends dry. A little odd but interesting, it has character. The hops aren't super consonant with the adjuncts but I like it. The smell was fruit, the taste just bitter enough to make it very drinkable. In fact I drank a four pack befor I realized it. nice IPA, but not too pine or flowery, but nice and fruity. L = Pours amber/light brown with a nice white head. S = Smells like an American IPA. A little sweetness in there from the fruit. T = Surprisingly not too hoppy for an IPA. I guess the fruit mellows it out a bit. I didn't get the taste of the fruit too much though. F = Very refreshing with good carbonation. O = Not bad. I was thinking that I would be able to get the fruit more and especially the ginger. The ginger came through a little after letting it sit. It might have been too cold to get everything, but I was thirsty and needed a drink. Poured easy into a pint with barely any head but every sip left a decent lace. Faint smell of a mix of sugar and citrus. Taste was refreshing - can’t deny the ginger. Easy to drink - wish it was a bit juicer, though. 12 oz. bottle, bottled on 2016A1223 on the bottleneck. My first new one from Dogfish Head in quite a while; acquired a single bottle of this stuff from the local bottle shop. "An India Pale Ale brewed with mango, apricots, & ginger". A - Dark coppery / brassy orange color on the pour, excellent clairty, obviously filtered, two fingers of frothy white head that stays a while, leaves random fluffy scattered lacing. Appears aptly carbonated. Looks very nice. S - Aroma is fresh, fruity, & floral. The mango & apricot is soft, but both are apparent, and there is a subtle tart / citrus element imparted from the ginger. Earthy, herbal, & grassy. The fruit elements are all very authentic smelling, but the aroma could stand to be amped up a tad. A strong bready malt backbone within. T - Juicy & fruity from the mango & apricot - melds very nicely with the bitter / piney / resinous flavors imparted from the dry-hopping. Bready caramel malts / brown bread. M - The feel is very smooth, crisp, clean, & easy-drinking, especially for the moderate 7.20% abv. Crisp carbonation & light-bodied. Overall, a nice fruited IPA offering from Dogfish Head. Very well-balanced and well executed. 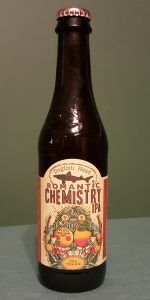 Dogfish Head Romantic Chemistry IPA -----4/5. Poured from a 12 oz. bottle into a chalice. Appearance: Pours a deep amber orange with a moderate amount of carbonation. About a finger of off white head which settles into a thin creamy layer. Smell: A pretty fruity hop forward aroma with a scent of citrus fruits and grass. Upfront citrus fruit hints of mango, apricot, grapefruit, orange, and lemon. Some hints of grassy hops. Malt hints of caramel, toast, and biscuit with some yeast. Some spice hints of ginger and pepper. A pretty nice aroma. Taste: Like it smells, a fruity hop driven taste with notes of citrus fruit and grass. Good citrus fruit notes of mango, apricot, orange, grapefruit, and lemon. Some notes of grassy hops and pine. Malt notes of caramel, biscuit, and toast along with some honey and yeast. Light spice notes of pepper and ginger. A very solid taste. Mouthfeel: Medium bodied with a moderate level of carbonation. Juicy, creamy, and smooth with a drying finish. Overall: A pretty solid spin on an IPA. Good juicy citrus flavor with a nice caramel malt balance. Copper colored with a half inch of beige resting on top. Vibrant carbonation bubbles are surging from the depths. Light lacing. In the nose I detect faint ginger and tropical hops. It leaves me wanting way more. The taste is much more appealing. I can definitely pick out the judiciously used ginger, which I think is a spice that is easy to overdo. I detect the apricots and light malt outside of that. The mouth is moderately carbonated and dense. A - pours a coper brown with good clarity and spotty lace after each sip. S - Tart Cherries, fruity, some spice, citrus hops. T - Smooth blend of citrus hops, spice, and semi sweet fruity finish. Ginger comes through faintly in the back end. Dry and bitter finish, but very drinkable. O - Solid IPA with good character. peach/apricot and some mango. The bitterness is pretty bold, but not necessarily in a good way. Kind of sharp. It doenst really compliment the sweetness, just clashes. I don't notice the ginger mentioned other than if it contributes to some dryness. Overall it is too much like a wine cooler/spitzer to me. Poured into a DFH glass a pretty nice clean/clear dark golden amber color, pretty nice carbonation, with a pretty nice one-finger plus thick/creamy off-white head, which leaves some really nice creamy sticky lacing behind. The nose is moslty malty, slight hop note, lots of apricot, some mango notes, cherries. The taste is pretty nice, malty, some hoppyness, apricots/mangos, slight spice, cherries. Medium body, ABV hidden pretty well, nice little bitter/dry finish, very slight spicyness also on the finish. Overall, this one did surprise me, I like it. Another different take on a style from DFH. Pours a pretty nice clean/clear dark golden amber color, pretty nice carbonation, with a pretty nice small creamy off-white head, which leaves some islands and sticky lacing behind. The nose is moslty malty, slight hop note, lots of apricot, some mango notes. The taste is pretty nice, malty, some hoppyness, apricots/mangos, slight spice.. Medium body, ABV hidden pretty well, nice little bitter/dry finish, very slight spicyness also on the finish. Overall, this one did surprise me, I like it. Another different take on a style from DFH.